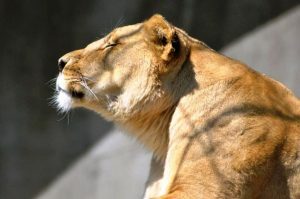 With great sadness, the Louisville Zoo said goodbye to 22-year-old female lion Kariba on Wednesday, January 30. Kariba had been on what the Zoo calls a quality-of-life watch due to her advanced age and declining health. The decision was made to humanely euthanize Kariba when she no longer responded to therapy. The median life expectancy of lions in a managed care system is 16.9 years. In the wild an adult female lion may live 10 – 15 years. Kariba came to the Louisville Zoo in 2000 from the Wildlife Way Station in California. The Zoo currently has one 3-year-old male lion named Siyanda.